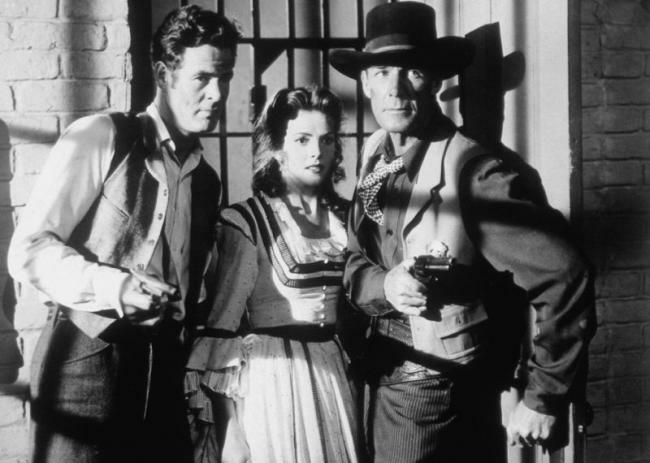 Robert Ryan | 50 Westerns From The 50s. 50s Westerns Blu-ray News #195: Day Of The Outlaw (1959). 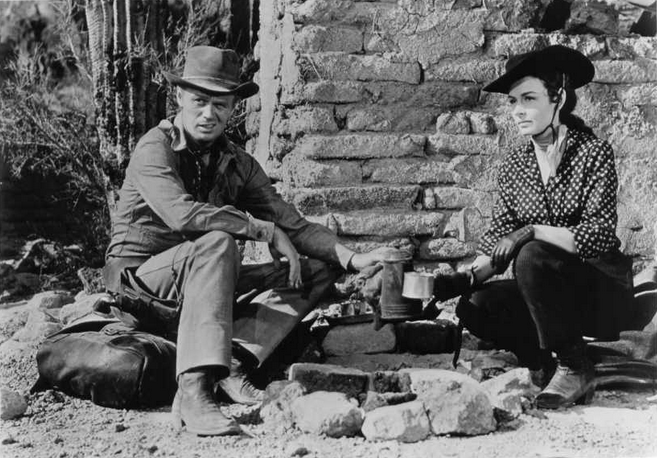 1959 was a great year for 50s Westerns, taking the decade out on a really high note. And, for me, one of the cream of the year’s crop would have to be Andre de Toth’s Day Of The Outlaw. It’s coming out on Blu-ray in the UK from Eureka Entertainment. Russell Harlan’s cinematography should make this a stellar Blu-ray. 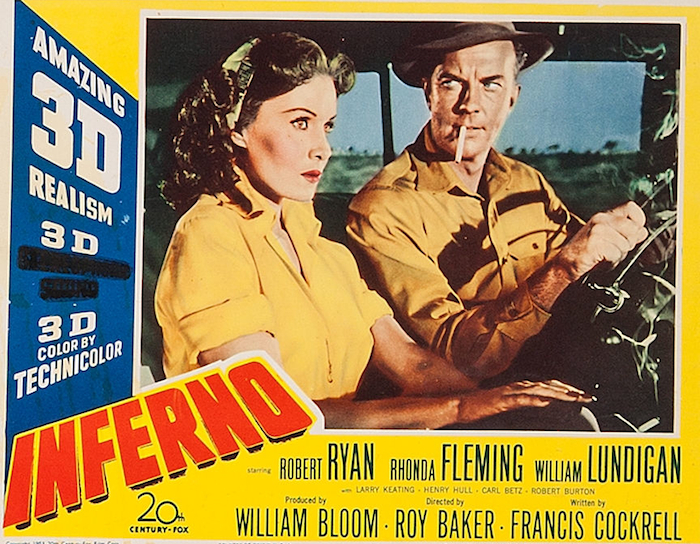 Inferno (1953) isn’t a Western. But it’s got enough of our usual stuff in it — cast, crew, locations, etc. — to seem like a pretty good fit. Truthfully, I just wanted to write about it, celebrate director Roy Ward Baker and lift up Panamint Cinema’s fine work in bringing it to DVD and Blu-ray. 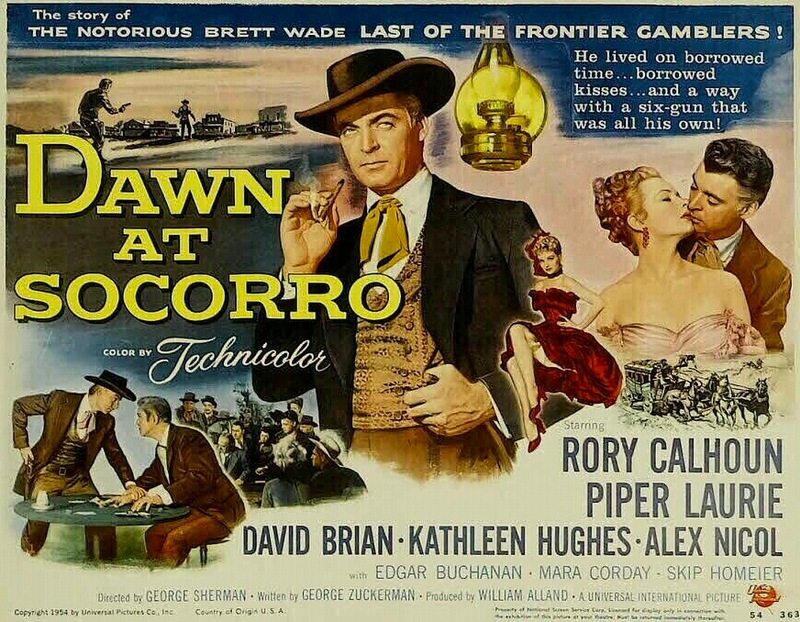 Robert Ryan is a tough, drunken business tycoon no one seems all that fond of. When he breaks his leg horseback riding in the Mojave, his wife (Rhonda Fleming) and her new lover (William Lundigan) decide to leave him there to die — they’re not killing him, they’re just not saving him. Sounds like a perfect plan. Only they didn’t figure Ryan would sober up, patch up his leg and start making his way back to civilization. Fleming and Lundigan are good, too. As the movie progresses, their paranoia and stress levels escalate. You just know it’s going to fall apart. It’s to the credit of everyone involved that our sympathy shifts from scene to scene — and in how satisfying it is when Fate takes over in the last reel. Director Roy (Ward) Baker was a master, and today, nobody seems to know who he is. He enjoyed a widely-varied career, bouncing from features to TV, from genre to genre, and from the US to the UK with ease. He got a great performance out of Marilyn Monroe in Don’t Bother To Knock (1952), directed some great episodes of The Avengers, made one of the best Hammer films, Five Million Miles To Earth (1968, known in the UK as Quatermass And The Pit), and gave us one of the most impossibly-great, damned-near perfect movies I’ve ever seen, A Night To Remember (1958). The supporting cast is a good one. Henry Hull is great as the old prospector who comes to Ryan’s aid. Larry Keating, who’s wonderful on The George Burns And Gracie Allen Show, is Ryan’s business associate, and he doesn’t seem all that upset, or surprised, that his partner’s gone missing. And Barbarba Pepper, Mrs. Ziffel on Green Acres, turns up as a waitress. 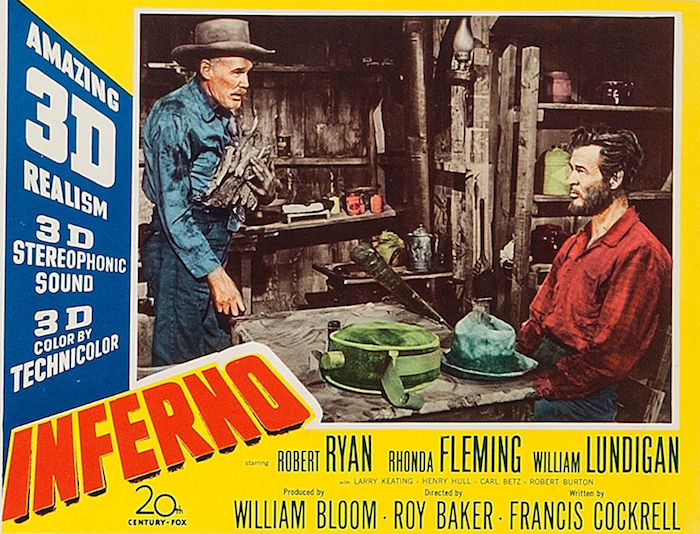 They say that back in the 90s, a British retrospective on Baker was reduced to running a 16mm TV print of Inferno. Luckily, Bob Furmanek of The 3-D Film Archive tracked down 35mm Technicolor prints of both the left and right sides — which this incredible region-free Blu-ray comes from (transferred by Dan Symmes). The picture is stunning at times, sharp as a tack with vivid color and just the right amount of grain. It looks exactly like what it is — a nice 35mm dye-transfer Technicolor print. This was an early stereo picture, but there’s only mono here. Bet the stereo masters are long gone. 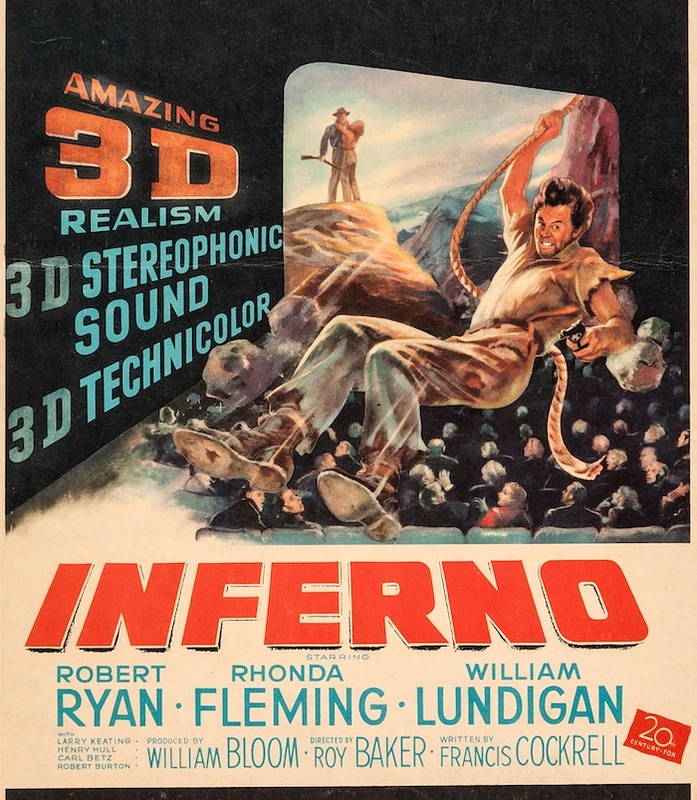 I wasn’t able to watch the 3-D version, which would have to be impressive since it comes from the same material. There’s a healthy batch of extras, from trailers to an interview with the great Rhonda Fleming. Inferno comes highly, highly recommended — both the movie and this beautiful Blu-ray. 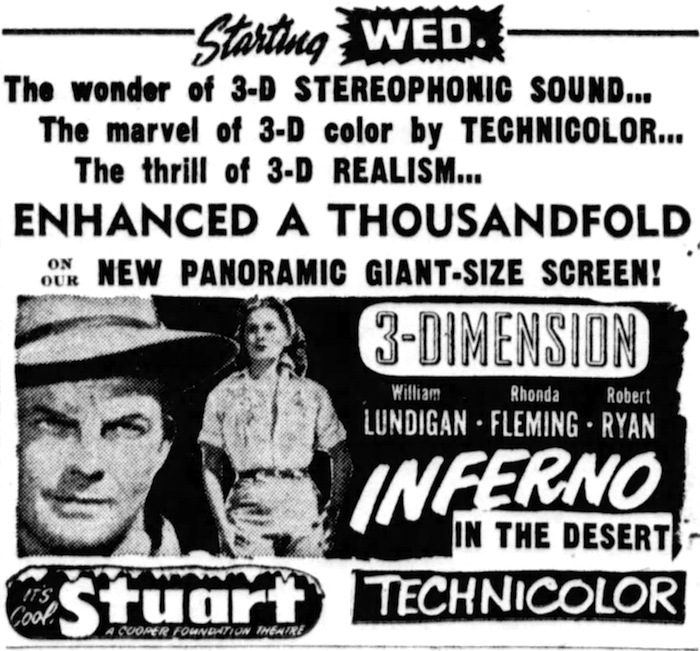 And I’d like to thank Bob Furmanek of The 3-D Film Archive and Russell Cowe of Panamint Cinema for getting it out there. 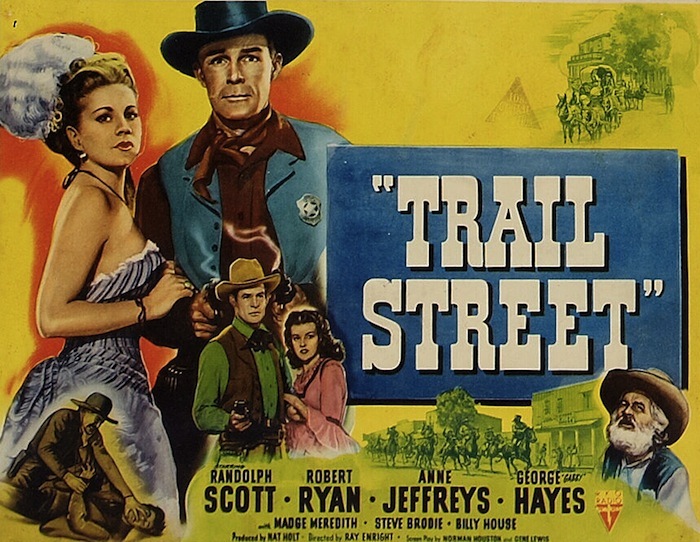 The Blogathon For Randolph Scott: Trail Street (1947) By Guest Blogger Jerry Entract. Cast: Randolph Scott (Bat Masterson), Robert Ryan (Allan Harper), George “Gabby” Hayes (Billy Burns), Anne Jeffreys (Ruby Stone), Madge Meredith (Susan Pritchett). I am delighted to be able to take part in The Randolph Scott Blogathon and would like to thank our host, Toby, for making it possible. Scott, however, had of course been a major Western star long before his association with Budd Boetticher and Burt Kennedy. We talk regularly here about those earlier pictures directed by Andre De Toth for just one example. Most of Scott’s films after 1950 were made or released by either Warners or Columbia (alternating sometimes). But his earliest western successes were probably those produced by Nat Holt and often released by RKO, directed by Ray Enright and others. I was first introduced to Scott in my childhood through these Nat Holt productions and they quickly became favorites. One that fails to warrant mention very often, it seems, is Trail Street from 1947. The story is a range war drama with the matter of law and order interwoven as farmers and ranchers are at loggerheads. The farmers cannot get their wheat to grow due partly to climate but mainly due to the free roaming of the ranchers’ cattle. This is exacerbated by the lack of local law and order. Into this situation rides Bat Masterson (Scott) who is enlisted as town marshal to bring a degree of order. He has a crusty old deputy played by George Hayes in one of the best parts in his career. “Gabby” is always a plus in anything for me. Scott also deputizes Robert Ryan whose character discovers a form of wheat that will withstand the drought conditions, so making a brighter prospect for the farmers and therefore the community. There is of course plenty of slam-bang shoot-’em-up action as one would expect and the different strands of the storyline are woven together well. As if the presence of Scott and Hayes wasn’t enough, we have the beauty of Anne Jeffries in support and the strong role played by the always-excellent Ryan too. Randolph Scott had been in films for quite a few years in 1947 yet had only recently decided to concentrate exclusively on westerns and as a result his star was on the rise (within a year or two he was in the Top Ten most popular male stars at the box office – ANY genre) and Ryan was also on his way building a name in both westerns and especially film noir as one of Hollywood’s finest actors. 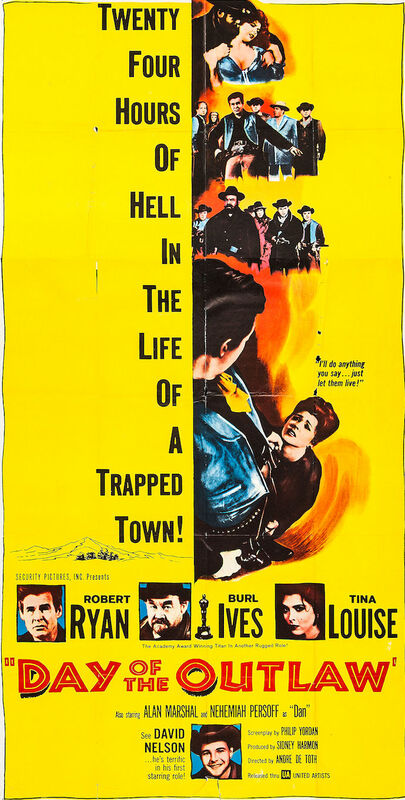 Trail Street was one of a sizable handful of westerns Scott made for Nat Holt but the three best, I think, were Badman’s Territory, Return Of The Badmen and this film. Later films are better known these days but I like to watch and enjoy any, or certainly most, of Scott’s westerns from 1946 on. For anyone unfamiliar I would heartily recommend this film and for those that are familiar I would heartily recommend a re-watch – soon! It is available from Warner Archive. Jerry Entract does not run his own blog or have any involvement in the film industry, but is an English lifelong movie fan and amateur student of classic cinema (American and British). Main passions are the western and detective/mystery/film noir. Enjoys seeking out lesser-known (even downright obscure) old movies. 50s Westerns DVD News #119: Warner Archive Wild West Hero Sale. You’ve got till 4/6 at 11:59PM PST to head ’em off at the pass. Mount up! Day Of The Day Of The Outlaw. Here in Raleigh, it’s looking like Day Of The Outlaw (1959). No movie that I know conveys cold as well as that one. 50s Westerns DVD News #107: Western Horizons: Universal Westerns Of The 1950s. Horizon’s West (1952) stars Robert Ryan and Rock Hudson as brothers on opposite sides of the law. Directed by Budd Boetticher, it costars Julie Adams. 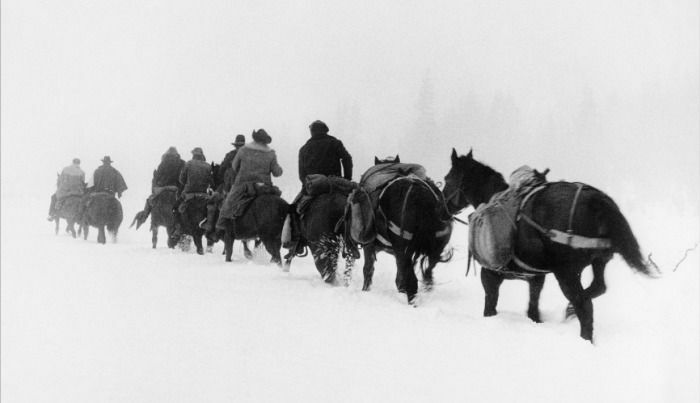 Saskatchewan (1954) gives us Alan Ladd, Shelley Winters, J. Carrol Naish and Jay Silverheels in a Canadian mounties picture directed by Raoul Walsh. Backlash (1956) puts Richard Widmark, Donna Reed, William Campbell, and Edgar Buchanan in the capable hands of John Sturges. Pillars Of The Sky (1956) from George Marshall is a CinemaScope cavalry picture with Jeff Chandler, Dorothy Malone, Ward Bond and Lee Marvin. Universal made so many worthwhile cowboy movies in the 50s — and this is a good lineup. Let’s hope it’s the first of many.